Halloween is around the corner. I'm super excited that it falls on a Friday this year. This means we get to go out a little bit later and the kids can stay up a little bit longer. Every year we get together with friends and family and we walk around our neighborhood with all the kids. After we walk with friends and their kids, the hubby and I then pack the kids up and we head to my in laws for pizza, chicken and fries. It's a tradition. We eat dinner and then the kids can go around Auma and Pepe's street to end their trick or treating. It's always really cold out and I'm always bringing a travel mug filled with hot chocolate or apple cider to keep myself and the kiddos warm as we walk around the block. 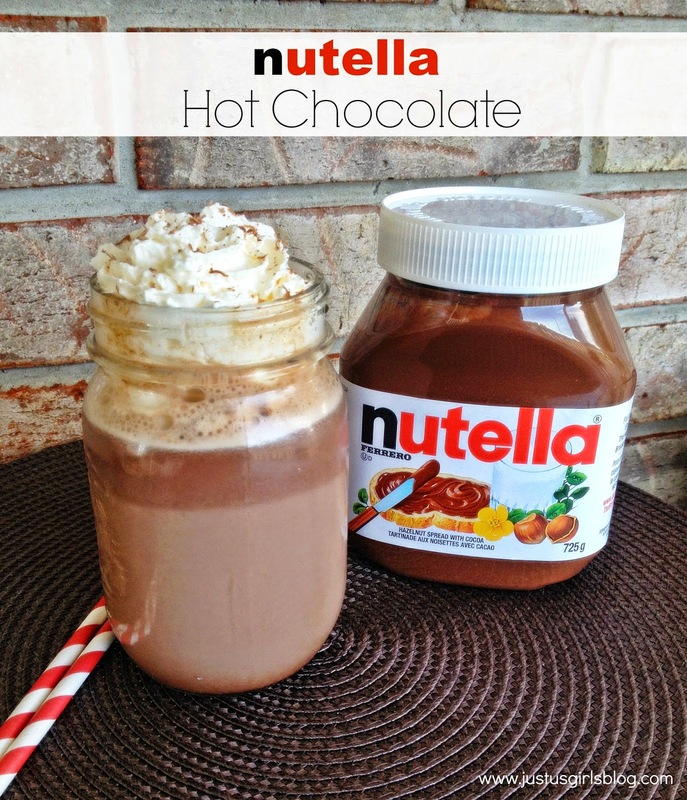 That's why this week's Thirsty Thursday is Nutella Hot Chocolate. Our house always has this delicious hazelnut chocolate spread in our kitchen cupboards. The kids absolutely love it. They love spreading it on toast, pancakes, waffles and dipping fruit in it. The kids love it and I have to admit it is pretty delicious. I sometimes go in the kitchen and sneak a spoonful of it without the kids knowing, but let's just keep that between you and me! I don't know why I hadn't made hot chocolate with nutella before. It's super easy and so delicious. I made this for the kids and they LOVED it. We went through a couple batches over the weekend, top it with whip cream and it's even better! I'll definitely be making this on Halloween to keep us all warm while we're walking around the neighborhood. I hope you try it and enjoy! In a medium saucepan over low-medium heat, pour in your milk, nutella, nutmeg and cinnamon. Whisk together until nutella is melted and the mixture is well combined and the milk is nice and warm. Serve in mugs and add whip cream or mini marshmallows.